An early prototype of the original iPhone has been shared online by Sonny Dickson, with a collection of images and a video that provide a glimpse into one version of the iPhone that Apple created and tested before ending up with the first iteration of the device. The prototype includes some similar features to the first generation iPhone, like an aluminium chassis, multi-touch compatible screen, 2G connectivity and Wi-Fi, but its entire user interface is taken directly from the click wheel system of Apple's original iPod line. Called "Acorn OS," the prototype software includes an on-screen click wheel on the bottom half of the screen and a menu system on the top half, and the two are bisected by a bar with rewind, menu, play/pause, and fast-forward buttons. 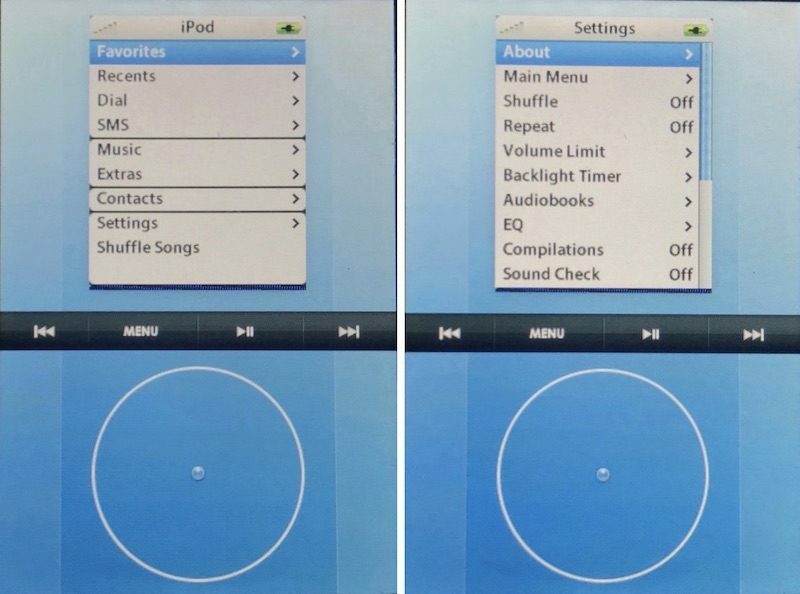 On the menu are options such as “Favorites”, “SMS”, “Music”, “Settings” and “Recents," and it's navigated by circling around the click wheel to go up and down, with a center press confirming an action, just like on the iPod. Instead of the modern touch-driven interface we now call iOS, it featured an operating system dubbed “Acorn OS” (this was an internal code name, and it unclear if it would have kept that name if it had been released), which is derived from the acorn shown on boot. Not much else is known about the device, apart from the fact that it differs heavily from the iPhone we know today, and that very few units running “Acorn OS” exist, with most of them likely being destroyed by Apple, a company in which there is a specific job role in relation to the destruction of prototypes. Dickson references Apple's patent for a "multi-functional hand-held device," filed and published in 2006, as proof that such a prototype did exist at one point and could potentially have been an alternate version of the iPhone. In one of the patent's drawings, a click wheel can be seen as a possible input method for the proposed device. The patent's abstract describes a product with "at most only a few physical buttons, keys, or switches so that its display size can be substantially increased." It's well known that to get to the current version of iOS we have today, Steve Jobs originally placed "iPod Father" Tony Fadell and Macintosh executive Scott Forstall in a head-to-head competition to come up with the best mobile operating system possible. The two teams represented a clashing idea that Jobs had for the iPhone: enlarge the iPod's OS or come up with a compact version of the Mac's OS. Forstall's team won, and it appears that today's shared prototype is a bygone leftover of the losing side's work. Check out more images of the iPod-inspired iPhone on Sonny Dickson's website. If Tim Cook had been in charge back then, we would be on aCorn OS 9.1 by now. It's a real testament to Scott Forstall's design that this seems so...clunky and that the iOS design seems so inevitable. Although Forstall gets a lot of hate for his penchant for skeuomorphism, it's clear from this video alone that he is one of the most important GUI designers in the history of computing. Wish Forstall still worked at Apple. And the TITLE of the link you provided? Ha ha. I was thinking the same think when reading -- that Tim Cook would have released this and said it was magical. BUT I don't think we would be on aCorn OS now. It wouldn't exist anymore. We'd be using BlackBerry 25 or Palm 32 while listening to music on our Microsoft Windows XP music edition iPod. Fascinating to see at least one possible option - the introductory keynote would have been mighty different! It's an oversized iPod! It's a digital clickwheel interface! It's a phone! Are you getting it? These are not 3 separate products, but one product. And it's called awful design! No it looks like iPod software which Steve Jobs did release.